Hot this week: Who looted the Boston Public Library? Thoughts on what preservation is and can be in light of Iraq/Syria. Somehow, I don’t think it actually is. The Hellenistic site was discovered in 2012 and the Egypt Heritage Task Force claims that the ministry improperly returned the site to the landowner who has damaged it. Antiquities Minister Mamdouh Eldamaty claims to have never met anyone on the Egypt Heritage Task Force and that there was extensive discussion and consultation about the site before and after decisions were made. The ministry denies reports that the bull was either illegally moved or damaged during travel. A discussion of art gallery theft in South Africa. The commentators see theft from galleries, dealers, and museums as on the rise. Following a two day conference, 6 recommendations were made to help combat current threats to heritage in the region. Two days after being stolen, a large collection of historic weapons that belong to the Villa Ana Forestry Museum have been recovered. The paintings left post-war Germany under dubious circumstances and have now been given back to Jewish heirs. The tree, a juniper, was taken from the Pacific Bonsai Museum after it seems someone jumped the fence and set of the security alarms just before 5am. The bonsai is back! But severely pruned. The memorabilia was stolen from Donley’s Auction Services in Union Illinois. Commentators say the pieces are too well known to be resold by thieves. In light of several thefts of art from homes in the area homeowners in this Florida city suspect a crime ring targeting Cuban works. It is unclear what made the juror in Luke Brugnara’s California trial so angry, but the person was dismissed and then detained. The works were taken from the print collection and inside sources say that they could have been missing for up to a year without anyone noticing. There is hope they are misfiled. More on the BPL works missing. One employee has been removed from her post following the disappearance of a Dürer and a Rembrandt print. She has not been charged with anything. Still more on the BPL art theft. Copper wiring and a Civil War Union soldier jacket were taken from the Pony Express National Museum, the second recent theft at the museum. The continued fight over a Pissarro in Fred Jones Jr. Art Museum at the University of Oklahoma considered to be Nazi-looted art. This ordeal is getting murky a trust associated with Dmitry Rybolovlev gets involved in the accusations that Catherine Hutin-Blay has been making against Olivier Thomas and Yves Bouvier. An attorney from the Ryvbolovlev family trust says so via email which seems to be at the core of the complaint against dealers Olivier Thomas and Yves Bouvier. More news from the Catherine Hutin-Blay case, over 60 works are allegedly missing from a storage facility in Gennevilliers. After learning someone was trying to sell the stolen horses on the black market and that there were other artworks involved a series of raids were conducted. The heirs have decided to sell the Lieberman painting at Sotheby’s. More on the sale of the Liebermann. The proposal, called “Stop Illicit Trafficking”, calls for a wider alliance between signatories regarding law creation and policing. A battle among relatives and the foundation about how the collection is displayed. Twenty people were detained and a suspected 35 people are thought to have been part of a plan to rob sacred art from the church of Santiago in Murcia. The 15th century panels were taken in 2013 and were spotted by a private collector being offered in an online sale. The collector notified the police. Operation Icarus has led to the recover of 60 stolen pieces of sacred art, including misericords taken from St Cuthbert’s in Holme Lacy, Herefordshire. Somehow a gorilla head was involved. On simply taking a painting off the wall at the Tate and walking out the door with it in 1956. Reporting on a conference against rare book and document theft to be held at the British Library. The 13 broken Buddhist statues are thought to have been looted and hidden by smugglers. A tip from the public led to the recovery. Looking into the return question in light of the Cleveland Museum’s return of the Hanuman statue to Cambodia. Oscar van Overeem bought it in Amsterdam from someone who bought it in Hong Kong. He claims he has proof it comes from ANOTHER temple in the same province but is sending it back. Begs the question why he didn’t send it back before. Specifically the idol was taken from Chennakeshavaswamy temple at Nallur village in Alur taluk in Hassan district. Iraq believes that their antiquities may be smuggled into India for a South Asian market and has warned Mumbai police as such. A horrific case. Thieves stole three idols, broke them open looking for non-existent gold, welded them back together, and were caught trying to sell them to a person who notified the police. Idols were panchaloha from Chennakeshava temple, Alur. A discussion of the stolen Nepali sculptures in western museums. The work of Joy Lynn Davis. Video. The sculpture is from Hebei province and its head was stolen in 1996. 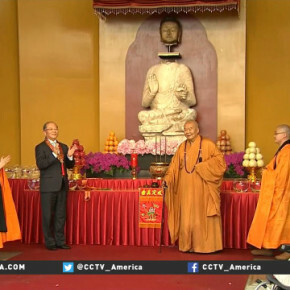 The head was donated to Taiwan’s the Fo Guang Shan Monastery in Kaohsiung in 2014 and the two parts have been reunited. Of the six statues taken from the historic Varahanath Temple complex in Jajpur town, one was a rare 13th century piece. The statues were from minor shrines in the main temple complex. After a stake out, the Israel Archaeological Institute discovered a site that seemed to have been looted was actually being excavated by 13-year-olds who were into archaeology. Still illegal of course but the kids have been directed to legal archaeology activities. Johnson has a lot of feels about the situation in Syria and Iraq but no real ideas about how to do anything about it. They’ve destroyed some plaster replicas and raised a flag but most of the museum objects had already been removed to Damascus. Police in Bursa raided a single storage unit and recovered 492 coins, 29 metal objects, and many marble blocks. The Armenian Apostolic Church is suing Turkey from the return of the ancient religious centre of Kozan, part of property that was sized during WWI. The draft law is meant to hinder looting and antiquities trafficking throughout the emirates.